Discovery Channel's captivating Emmy-nominated television series Deadliest Catch documents the brave captains and crew members of several Alaskan crab fishing vessels throughout the October King Crab and January Opilio Crab seasons, as they struggle against treacherous weather conditions on the Alaskan high seas, performing one of the most dangerous – and lucrative – jobs in the world. Located on Amaknak Island, the Aleutian Islands port of Dutch Harbor is the base of operations for the intrepid fleet, which plies the unpredictable waters of the Bering Sea. The show is so-named because the crews run a high risk of injury or death – commercial fishing has the highest fatality rate of any occupation, almost 30 times the average. Alaskan crab fishing is considered even more dangerous due to the conditions of the Bering Sea, which include frigid gales, immense rogue waves the size of four-story buildings, and potentially fatal ice build-up on the boats and equipment from the 2000 gallons of water that crash onto the deck each minute, freezing as it hits. Injuries are the norm and the death rate during the main part of the season averages nearly one fisherman per week; over 80% of those deaths are caused by drowning or hypothermia. During filming of the first season of Deadliest Catch, the F/V Big Valley sank on January 15, 2005 at the start of the Opilio Crab season. Five of the six crew members perished; three were never found. Discovery Channel film crews captured the first footage of the debris field, confirming that the boat had capsized and gone down. Coast Guard investigation later determined that the boat was severely overloaded, causing it to tip over during a storm. Within 24 hours, the F/V Sultan also lost one of its crew to drowning. In October of 2006, F/V Ocean Challenger’s four-man crew abandoned ship as their boat capsized and took on water; one member survived, two bodies were found and one was lost. Efforts by the US Coast Guard to rescue those crews were featured in two episodes of season three. In March, 2008 the Alaska Ranger sank, with 5 crew members declared dead or missing and 42 rescued. The Discovery Channel camera crew members are also endangered by the situations they film aboard the boats; during one episode a crab pot line slipped out of the hydraulic block hauling it back to the surface and the sudden drop of the pot caused its buoys to fly into the air, nearly entangling the cameraman. In another instance, the captain had to yell at a filming cameraman moments before an enormously heavy crab pot swinging from a crane would have collided with him. Each episode focuses on a story or situation that occurs on one or more boats, with side stories on the backgrounds and activities of one or two crewmembers, particularly the "greenhorns." The fleet's captains are featured prominently throughout the series, which highlights their camaraderie and friendly rivalry with fellow captains and relationship with their crew, as well as the competitive nature of the crab hunt, the familial ties throughout the fleet, the stresses of life on the Bering Sea and the high burnout rate. Since crabs don’t show up on radar or hold to the same 100-mile migration pattern each year, captains must rely on experience and intuition to locate the best fishing grounds, making for additonal uncertainty and challenges. In the upcoming fourth season, viewers will experience life above and below the Alaskan waters. Submersible cameras capture unprecedented underwater images of crabs migrating on the bottom of the ocean and entering crab pots. In addition, footage shot from a "chase boat" shows just how insignificantly tiny the boats are in the vastness of the Bering Sea; for the first time viewers will see the fishing vessels tossed around by high winds and rough seas. The unique angle will offer a new perspective of the men working the rails, setting and hauling massive 800-pound crab pots up through 400 feet of water as their boats fight the crashing waves. Viewers will also get a more in-depth look at the men who put their lives on the line in search of Alaskan crab. Some shots that would be difficult to capture, such as the functioning of a crab trap, the lethal effect of an overloaded deck or playful sea lions tearing open crab pot buoys, are computer generated. 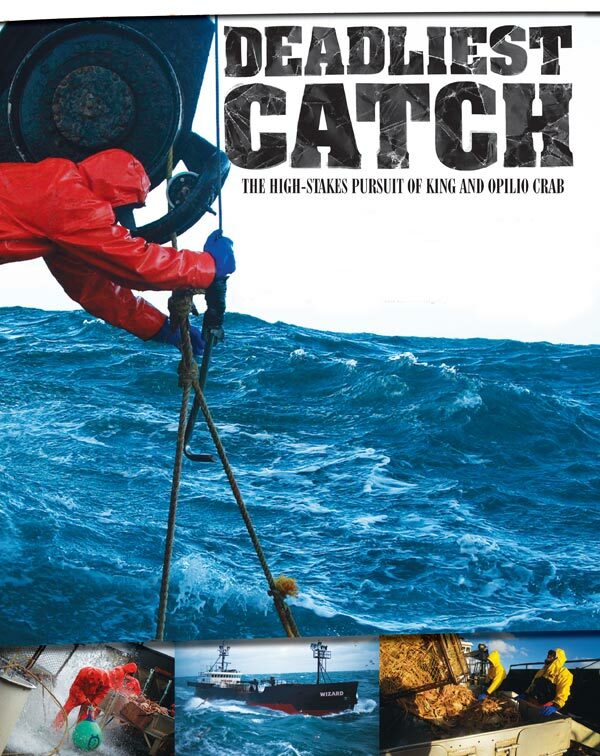 The series' first season was shot during the final year of the old derby-style king crab fishery, which supported a large number of crews competing with each other to catch crab during a restrictive time window. Under the new Individual Fishing Quota (IFQ) system, established boat owners have been given quotas, which they can fill at a more relaxed pace. In theory, it is intended to be safer, which was the main rationale for the change in the fishing rules. However, the new system put many crews out of work, as smaller boats were unable to meet operating expenses with their assigned quotas. During the first season run under the IFQ system, the fleet shrank from over 250 boats to around 80 mostly larger boats with high quotas – the fishery profiled on the current series is a very small remnant of what it once was. Living 30 years or longer, Alaskan red king crabs attain an average weight of 6 to 10 pounds, the record being 24 pounds with a 5-foot leg span. At the current $4.50 per pound payout, fishermen can make between $27 and $45 for every adult male crab caught; all females and juveniles must be thrown back. The crabs are held alive in the boats’ tanks and if a single crab dies, the toxins emitted can poison the entire catch, so the crew has to insure optimal water salinity, temperature and circulation. Check with your local station for this year’s Deadliest Catch on the Discovery Channel.